Never had a garden before. I have a small one now. 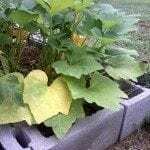 In the beginning, I was growing green cucumbers. Now all that is growing are yellow ones. It's been very hot here the last month or so. Is it the heat? Watering tips?? Thanks.